Home improvements, while exciting, can be a lot of work — even more so when you’re a dog owner. Along with having to feed them, play with them, and exercise them while your house is in the throes of remodeling, you will also have to protect your furry friend from getting into things they shouldn’t. Home improvement materials like paint, chemicals, cleaning products, nails, tools, and a whole list of other things can pose serious threats to dogs. While you can do your best to keep them from getting into these materials, dogs are, by nature, curious creatures that use their noses and mouths to explore things. They can easily pick up tools, construction materials, and chemical-based products that can injure them, make them ill, or even be fatal. As your Top Rated Local® veterinarian and dog boarding facility in Kansas City, we always have your dog’s health and safety in mind. 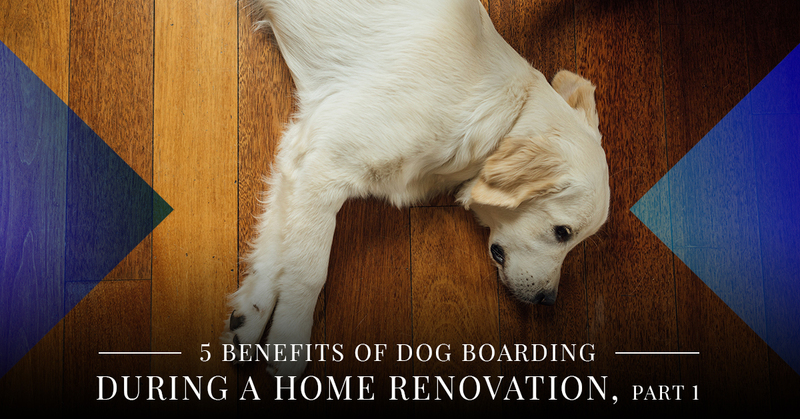 Below are five benefits of boarding your dog when you’re doing home improvements this summer. Ready to book a pet suite for your dog? Call us to reserve a room for your precious pup in our state-of-the-art dog boarding facility. When your dog stays with us during your home renovations, they will be constantly cared for and looked after by expert veterinarians, professional dog boarding attendants, and our caring support staff. Your dog will have access to the best pet care by a truly kind and compassionate team of veterinarians, vet techs, and kennel assistants. Should a medical emergency arise with your pet’s health during their stay, you can rest assured in knowing they are in good hands with our team. At Eagle Animal Hospital and Pet Resort, our entire team is fully trained and certified as a Fear-Free animal care facility, which extends to our dog boarding pet resort. We will make your precious pup as comfortable as possible during their stay with us. We are devoted to creating a comfortable, fun, fear-free environment where your furry friend can relax, play, and socialize with other dogs during their stay with us. When performing home improvements, it can sometimes become easier for pets to escape from their homes and yards. Amidst all the chaos of a home remodel, doors get left open, gates can be left unlatched, and yards can become less secure. Dog boarding is a great way to ensure your dog stays safe and secure during a home renovation. When you board your dog during home renovation projects, you eliminate the risk of them coming in contact with or ingesting poisonous chemicals and other dangerous products. If they get harsh chemicals on their skin or in their eyes, they could suffer painful burns or itchy skin irritations. Even something as a simple as paint can make your dog sick. Therefore, boarding your precious pup ensures they are kept away from these and other products that could harm them if ingested. There are a million and one things that can go wrong during a home renovation. With all the tools and construction materials used, the chances are good that your dog could step on or swallow a nail, screw, or other sharp objects that could seriously injure them. What’s more, it’s easy for people to trip and fall on different building materials scattered about, which could also injure your dog if you were to fall on them. Boarding your dog ensures they are kept in a safe, clutter-free environment where they can play and exercise without the worry of getting injured by a sharp or falling object. If you have a home improvement project planned for the summer, consider boarding your dog. At Eagle Animal Hospital and Pet Resort, we provide expert dog boarding in Kansas City for reasons such as this, which can really help dog owners during a chaotic home renovation. Plus, your dog will be cared for by our dog boarding staff and treated as if they are a member of our own families. Call us today to reserve a room for your furry friend in our dog boarding facility while you upgrade your home.